33 has been on my mind today. Not because we are on day 33 of our wait. We are on day 28 for that. The reason the number 33 kept going through my mind all day today is because it is 33 months since my Emma left this earth. 33 doesn't seem such a big number. It doesn't seem like a small number either. It is just a number. When I was in my teens 33 sounded like so many years and now that I am almost 40, 33 seems so young. It is just a number, I know. 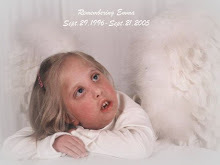 But, somehow, the number of months since Emma left us does seem significant. 33 is not just a number when you use it to mark such a significant event. In the first few months after Emma died I just tried to make it one day at a time and the thought of months was overwhelming. I could only deal in minutes or hours. To think of 33 months would have been impossible. Now I can look back and see that I made it one minute at a time, one hour at a time, one day at a time. 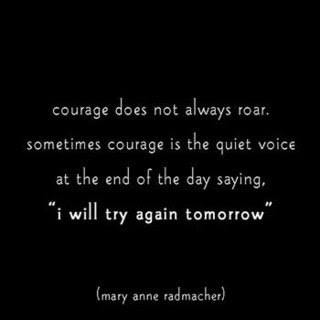 I heard someone use this quote recently and it made me think about those first dark days and how I just tried to make it through the day one minute at a time. I didn't think of myself as being very courageous at the time but now that I look back, I see the courage that it took to just get out of bed in the morning and start a new day. I see that I am stronger than I ever thought I could be. The thing is, I see that the reason I am strong or courageous is that I have a Savior who loves me. I had the wonderful privelage of meeting the author of "The Shack" today and he said, "God doesn't heal us so that He can use us because God is not a user. He heals us because He loves us." On this day when I was so preoccupied with the number 33, I needed to be reminded that my God loves me and He wants to be my strength. Not so I can go out and be used but because He just loves me so much. 33...another number to be written down in my calender of days passed without my Emma, but also a reminder that I am strong and courageous and I can face more numbers that mark the time passing. And a reminder that I am loved beyond measure. Hugs for you today, Stacey. We will get together someday soon, somehow, some way! :-D I really want to do that.